Finding men’s waxed backpacks that walk the right line between tough and fashionable. Now that’s a combination you wouldn’t hear so often! Rugged and stylish? I mean, sure, some people love a good mountain man. But stylish? We’re not so sure about the guys themselves, but when it comes to Builford men’s waxed backpacks, we are. These tough waxed canvas packs are also at the top of style. So how do they do it? Actually, it’s not really a secret. The combination of waxed canvas and leather is naturally rugged. It recalls a time of industrial workers and outdoorsmen, the sort of bag you’d imagine a John Muir or the like carrying. But Builford doesn’t just slap some waxed canvas together, bind it with leather, and call it a day. There’s a lot more engineering to it. While these men’s waxed backpacks are extremely functional, practical bags, there is a strong design element to them. The overall appearance, shape, and inspiration of these men’s waxed backpacks often comes from the past. But the next step is to blend with current day designs and styles. An old drawstring knapsack like the Classic Backpack gets an upgrade to a more modern style, and so on. Of course, you can still use these men’s waxed backpacks for outdoor activities. They are durable enough and even with a more modern design, have the space necessary for a more nomadic lifestyle. But either way, they will bring a unique touch to any man’s wardrobe. Want to find out more? The two bags featured in this post are the Classic Backpack and the Basic Backpack, both available for purchase on the Builford website. Builford’s men’s waxed backpacks do run a little over the market price, but that is primarily due to their hand assembly and lifetime guarantee. When you get a Builford backpack, you’re set for life! 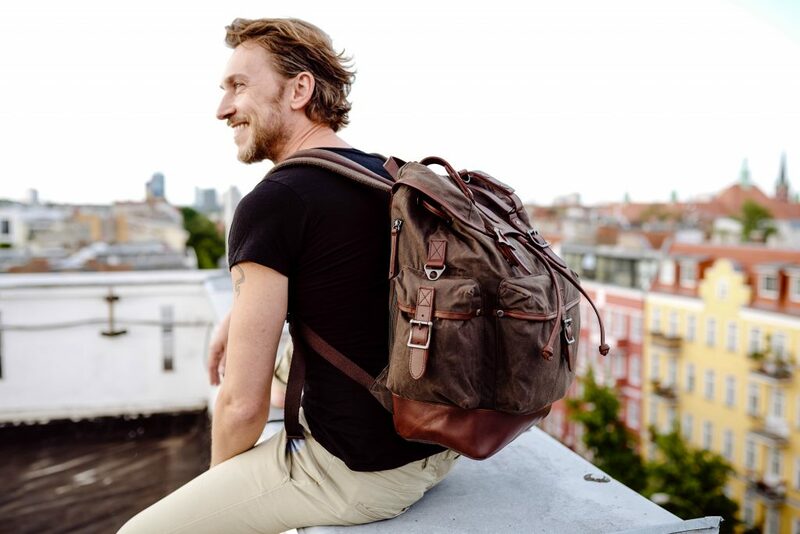 Share the post "Men’s Waxed Backpacks That Are Both Rugged and Stylish"
Posted in Blog and tagged builford basic backpack, builford classic backpack, builford waxed canvas backpack, men's waxed canvas backpacks, men's waxed canvas bags, mens backpacks, waxed canvas backpacks. Bookmark the permalink.